I have recently joined Pinterest and I have already become completely addicted. Being an artist myself, I love that it is based on all visuals. So, if you are not yet on Pinterest, I am sure you are wondering what it is all about and how in the world can you find meal ideas there? It lets you organize and share all the beautiful things you find on the internet. 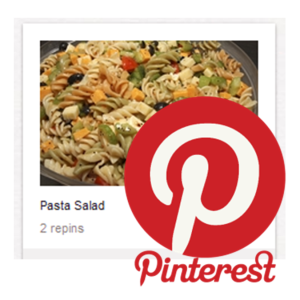 People use pinboards” for all different things such as planning a wedding, decorating a home, and even organizing recipes. You can also browse pinboards created by other people. It is a fun way to discover new things and get inspiration from people who share your interests. 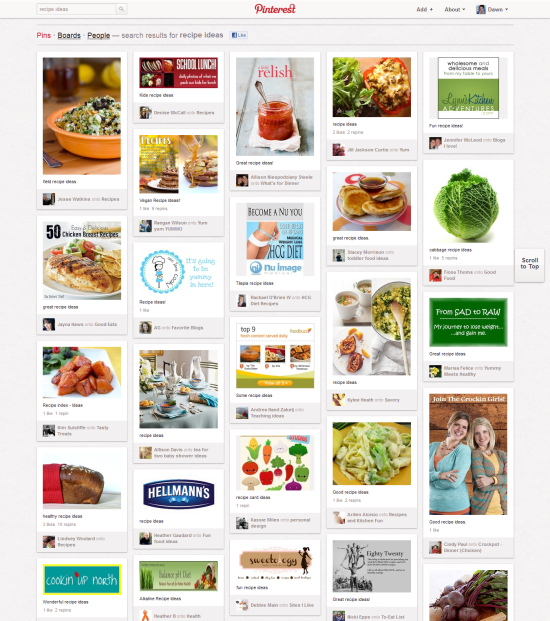 Here is an example of what Pinterest looks like when you search under a specific term. This one was under “recipe ideas”. As you can see there are a bunch of different images that you can click on that will open the pin and eventually take you to the site where the recipe is located. I am not a huge fan of cooking and being that I am so busy with work and other things, I don’t often get too creative when I cook. And my kids always complain anyway. After getting completely bored with the usual boring meals that I make, I was seeing some very cool meal plan options on Pinterest so I started to pin away. Just by searching a little bit, I came up with a bunch of new dinner ideas for my family. 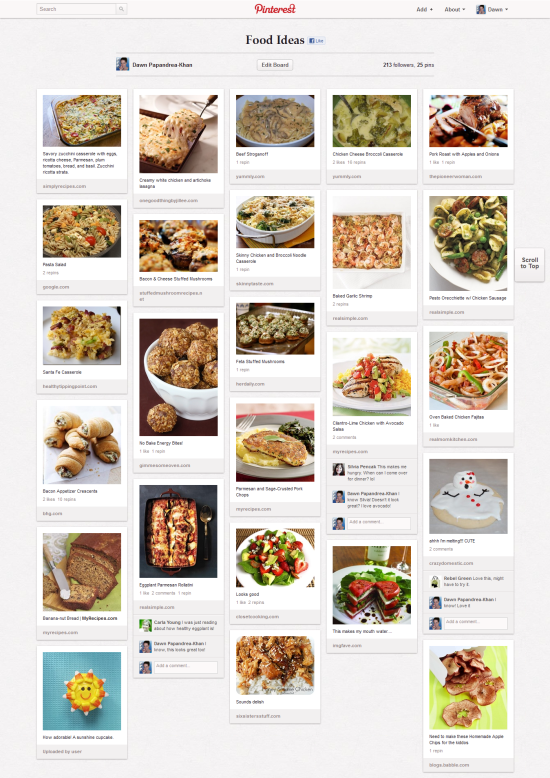 Here is a screenshot of my pinboard for “Food Ideas”. I have found everything from chicken cheese broccoli casserole (which I recently made and came out fab) to stuffed mushrooms and eggplant lasagna. You have to try it! Do a search under “Dinner Ideas” and see what you find. And the neat thing is they are always changing because people are pinning new things all the time. I love that Pinterest is based on visual images and photos. It is so much fun and even addicting once you get on and see all of the cool stuff and begin building your own pinboards. So, if you are in need of dinner ideas for your family, then definitely try Pinterest and be sure to come back and leave me a comment and tell me what new meal you made. And if you are already on Pinterest, I would love to hear what your favorite thing is about it and leave your Pinterest link so I can follow you! I haven’t used Pinterest before but have been hearing a lot about it. Thanks for sharing about it and what you have done. I like that! I love searching for food photos on Pinterest too! But I usually find those dessert and cupcakes photos, and they all look so irresistible!